Sometimes it starts as an innocent mistake, shall we say a case of mistaken identity. You go to make your morning coffee, and your beloved mug is not where it should be. The following week you go to the kitchen and your mug is lying abandoned in the sink with green tea stains all over it?" and you don't drink green tea! 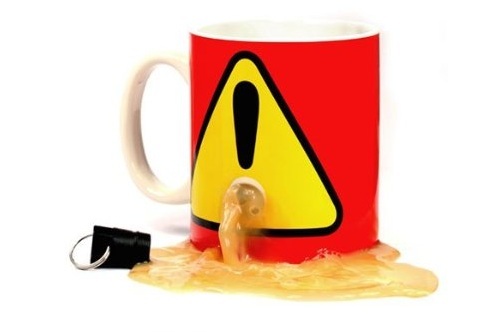 Before you know it, your mug has been round the office more times that the mail trolley, and has become home to more varieties of beverage stains and lipstick marks than is proper for a decent mug. That's the problem, so how do you fix it? tape the mug to your arm? Superglue the mug to your desk? Quit work start campaigning for awareness relating to mug theft and misuse? These are all worthy ideas, but we appreciate that you don't have that kind of time on your hands (nor want mugs stuck to your hands!). Price: $19.99 & eligible for FREE Shipping on orders over $25.